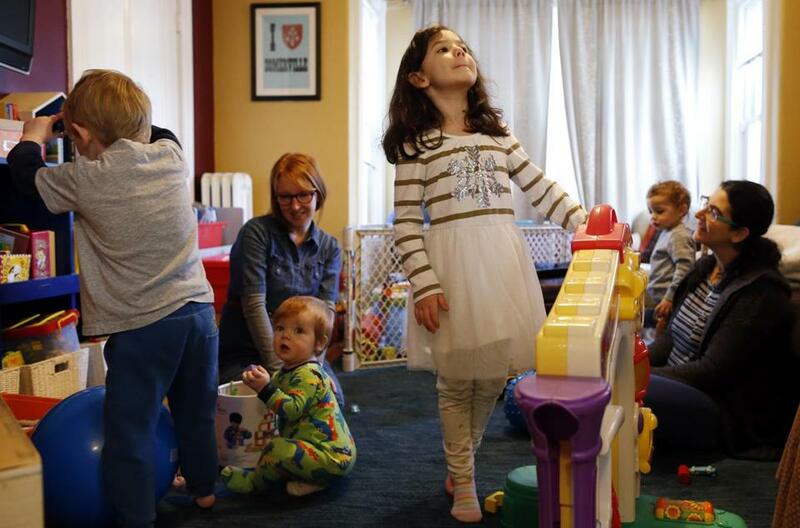 Kat Rutkin (second from left) watches her two children, Sumner, 4 (left), and Graham, 11 months (third from left), as Lucie Lippens, 4 (center), and her brother Jude, 1, play near their mother, Michele Lippens, at the Rutkin home in Somerville. This “city has this incredibly supportive, collaborative community,” Rutkin said. It took my husband and me nearly two years to buy our first house. This was partly due to money — we wanted a healthy down payment. Mainly, though, we wanted to stay in the neighborhood where we were renting. We liked the schools, the people, the shops, the lifestyle. We had friends here. So we patiently (OK, nervously) marked time until something habitable appeared on the market. When it did, we pounced. Is our house enormous? Nope. Do I long for my own bathroom whenever my son leaves the toilet seat up? Yep. Did we overbid? A bit. My parents thought we were crazy. “Move farther out,” they said. “You’ll get more for your money. You paid how much, and the kitchen isn’t even new?” We’re happy, though. We didn’t need more space or new amenities. We wanted to live where we knew people. Realtors say this is true of many younger buyers, that a neighborhood lifestyle means more to them than the traditional requirements like square footage and acreage. These buyers are willing to do whatever it takes to attain that lifestyle, too, even if it means heavy compromise. For many, three blocks to a coffee shop is more important than a two-car garage, especially because first-time buyers wait longer to buy their first homes and have already created communities in the areas where they rent. “We’re not ready for the suburbs. 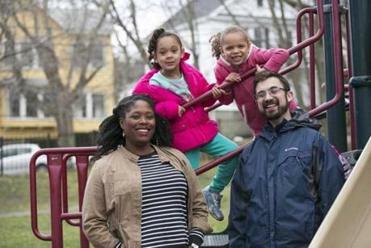 We’d been so used to living in Beacon Hill and walking everywhere that moving out to a suburb would be giving up a part of our lives,” said Caitlin Meyer, a new mom who now lives near Inman Square. “We love walking out the door for coffee.” She and her husband love it so much that they’re negotiating to buy their 1,100-square-foot rental without an inspection or contingencies. “It’s terrifying, but we’re willing to do it because we love our neighbors and neighborhood,” Meyer said. Meyer will pay $50,000 to $100,000 more than what she and her husband had budgeted — a fact that might stun out-of-towners unfamiliar with Boston real estate. “My mother said, ‘When I saw what you paid for your house, I was appalled,’ ” said Kat Rutkin, who lives with her husband and two kids in Somerville’s Winter Hill. Her single-family house felt like a bargain, though, after the couple toured homes infested with termites. Rutkin is a moderator on Somerville Moms, a busy online parenting group, and she’s worked with Somerville Local First, a tight-knit business collaborative. She launched a portrait business recently, too, and she relies on her neighborhood friends to spread the word. “Somerville has this incredibly supportive, collaborative community,” Rutkin said. Nowadays, this might be worth the demoralizing house-hunt process, the overbidding, the low inventory, and maybe even termites. Home buyers aren’t mortgaging a house; they’re investing in a lifestyle. From left, Mareshia Donald; her 5-year-old twins, Gloria and Inara Donald-Sosnoff; and her husband, Joe Sosnoff. The family bought a home in Arlington because of the friends they made there and its proximity to Cutter Park. Take Mareshia Donald and her husband, Joe Sosnoff, who rented in Arlington for years in hopes of buying. Donald initially lived in affordable housing there while completing school; she and her husband then began renting near Arlington Heights, a neighborhood they loved. They looked in other towns, but kept coming back to the truth: They wanted to stay where they loved, even if it was a stretch. They found a house just a few blocks from their rental after a two-year search. The couple wrote a letter to the prospective sellers explaining how much their local community and friends mattered: “With our extended families as far away as California, we have realized how much we lean on our makeshift family — our friends. We are fortunate enough to have friends (chosen family) we love dearly, growing their families in Arlington. We imagine our children playing together in the backyard & helping each other out when someone needs emergency babysitting or school pickup,” the couple wrote. “A center makes a difference. We walk to the library and bike path. It’s all about a cohesive community,” Donald said. For these buyers, areas where the houses are tucked behind bushes simply don’t offer that cohesion, especially in an era where people are home less and work more. “I grew up in the suburbs, and we weren’t ready for that lifestyle yet; I didn’t want to spend time in a car or on the commuter rail every night,” said Gwen King, a Boston attorney. She and her husband bought a two-family in Jamaica Plain in 2014. They spend their weekends taking their 1-year-old to parks and to the zoo, and she gets parenting support from JP Moms, an online forum that serves as a kind of platonic matchmaking service for parents. Plus, her commute takes just 25 minutes, leaving her more time for fun. What about the schools, though? A top school system has always been a marquee factor in choosing where to live. The new generation of buyers feels empowered to contribute to underdog school systems that don’t always appear at the top of the rankings. “My sense is that our schools will keep improving; there are people so invested in making this neighborhood great, and improving the schools is part of that. There’s a strong community of involved parents,” Meyer said. “Parent involvement trumps rankings. I am a huge cheerleader of Somerville’s school system, and the schools sold us on staying,” Rutkin said. The allure of the suburbs still endures, of course — space, greenery, peace and quiet. But suburban buyers place a premium on neighborhoods, too, targeting specific areas in their search as opposed to falling in love with a house. Before Wendy Missouri‘s family moved to Needham, they drove around not just to look at homes, but to scout out streets, targeting areas where they saw people out and about. It paid off. “We’ve met more neighbors in three months than in the years we lived elsewhere,” Missouri said. Even these quieter areas can replicate an urban closeness. Larry and Erin Tosi live in an Ayer neighborhood filled with ranches and split-levels. It’s a far cry from Jamaica Plain or Cambridge, but the neighborhood — which residents call “The Hood” — is busy. One homeowner has an ice rink in the front yard. Other families play Monday night whiffle ball games. Still another has a large-screen projector and hosts movie nights. “Halloween and holidays are amazing,” said Larry Tosi. My kid isn’t, either. Right now he’s down the street playing baseball with our neighbor. Our house might not have oodles of square feet, and I have to share a bathroom, but who cares? Our neighborhood is our true home.